On Monday, May 11 around 8:00 a.m. the Calcasieu Parish Sheriff’s Office responded to a call at a residence in Lake Charles in reference to suspicious circumstances. Detectives learned Carl Mark Slaven, 54, Lake Charles, had held two elderly family members, ages 83 and 91, overnight against their will. Slaven broke their home phones and their emergency alert necklaces and emergency alert callbox so the family members could not contact anyone. Slaven struck both family members and forced the family members to provide him with signed checks from their personal bank account. Once Slaven obtained the checks, he forced one of the family members, at knifepoint, to drive him to an undisclosed location. 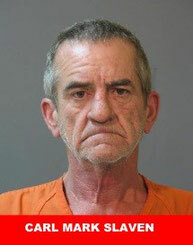 Slaven was located later the same day and was arrested and booked into the Calcasieu Correctional Center. Slaven is charged with false imprisonment with a dangerous weapon; simple battery of the infirmed; armed robbery; and aggravated kidnapping. Judge Ron Ware set his bond at $225,000. The investigation is continuing with additional charges possible. CPSO Detective Brent Young is the lead investigator on this case.